Katyayani Homam is very must and highly recommended fire ritual for all married couples to lead a happy married life and unmarried boys and girls to get married on timely without any delay. Goddess Katyayani is the sixth incarnation among Navadurgas. Due to the severe penance of sage katya to goddess bhagavathi, Katyayani was born as a daughter of sage katya. As per vedic scriptures, she took conception in Katyayan's ashram to shield the sages and devas from the devils and villains. The anger of the devil, Mahishasura was expanding frightfully in all the three universes. With a specific end goal to slaughter this evil spirit, the trinity of Gods - Brahma, Vishnu and Shiva, made the Goddess Durga who was a total of the forces of every last one of all gods. Prathana, Ganesha Puja, Doopam Deepam Neyvetyam, Karpoora Aarthi/Deeparathana, Mantra Pushpham for Ganesha, Sankalpa to Ejamanars/Sponsors, Yadhasthanam, Kalasa Avahanams, Archana for Avahana Devadas, Doopam Deepam Neyvetyam Deeparathana, Rudram, Chamakam, Purusa Suktham, Narayana Suktham, Durga Suktham, Sri Suktham, Bhakya Suktham, Shanthi Panchakam, Pavamana Suktham, Ayusha Suktham, Katyayani Puja (Moola mantra Japa), Agni Invocation, Ganesha Homam, Parivara Devada Homam, Katyayani Homam, Doopam Deepam Neyvetyam Deeparathana, Namaskaram, Maha Purna Huthi, Kalasa Deeparathana/Maha Deeparathana, Mantra Pushpam, Yadhasthanam, Kalasa Purochanam/Holy Water, Maha Prasadams, Final Namaskaram Process/Blessings from Bramanas. 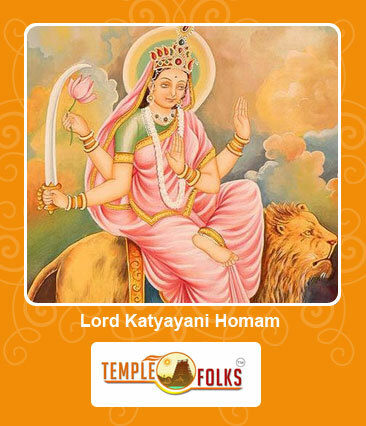 Katyayani homa is a perfect one for women to ensure timely marriage by removing hindrances to a larger extent. It helps for clearing doshas in the horoscope of a person to attain health, prosperity and wealth. In addition, this homa also helps to overcome complex problems even after the marriage. The main objective of this homa is to avoid delays in marriage by meeting exact needs. Another advantage is that it helps newlymarried couples for giving birth to children at the correct time. - Must homam for all married couples to have an everlasting happy married life. - Not getting married timely. - Problems in the Marital Life. - The Kundali of girl and boy are not matching. 1. Homam prasadam from Yagna Centre. 2. Manjal Saradu (Yellow Sacred thread), Manjal, Kungumam(Sindoor), kunguma chimizh. We at Vedic Folks are proud to possess the most authoritative experts who have the knowledge and ease to invoke these powerful radiations who can bring all success in your Life by removing negative effects and all obstacles !